Home > Block Patterns > Quiz: Which Quilt Block Pattern Are You? 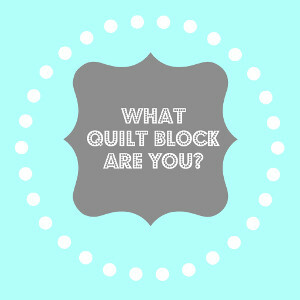 Quiz: Which Quilt Block Pattern Are You? Which Quilt Block Pattern Are You? Take our simple quiz to find out which quilt block pattern you are! Pick an answer and tally up your points. When you're done, scroll down to find out the results! 3. Who's your favorite celeb? 4. What is your dream vacation? 5. What's your favorite animal? As the Granny Square Quilt Block, you're a classic. You appreciate the simple things in life and enjoy a low-maintence lifestyle. The great thing about a Granny Square Quilt Block is that it will never go out of style, just like you. As the Herringbone Quilt Block, you are polite and lady-like. You throw the best tea parties in town, with the cutest finger sandwiches and crumpets. Your friends are in awe of how put together you are. As the Star Quilt Block, you're a Southern girl at heart. You love your friends and family more than anything. The fabulous thing about a Star Quilt Block is that she always knows how to throw a good BBQ. As the Crazy Quilt Block, you know how to have fun! Everyone says that you're the life of the party and enjoys your company. Crazy Quilt Blocks are wildly spontaneous and have the best stories of all of their friends. Leave a comment and share your results below! Leave a comment...Your quiz indicates I'm the herringbone quilt block sorry! I don't even like the block! I am not a lady all prim and proper but I enjoy life as myself. Surely you can do better than that! But I know I can! For the quiz I am a Herringbone. I took it before and I was a granny square. I am a star block! But I must add, I am a scrappy star for sure as I love my scrappy quilts! I'm a crazy quilt block-- no pattern, just whimsy!! !